Pushups can be an excellent way to work your upper body without the use of any equipment or gym membership, and they can be done anywhere during your spare time. There are many different varieties of pushups, but the most important aspect is technique. You can do push-ups fast or slow, with both ways having benefits and drawbacks; it all depends on your workout goals. Time under tension, or TUT, is a weight training technique popularized by strength coach Charles Poliquin in 2000. The technique focuses on keeping your muscles under constant strain, forcing them to work harder, increasing muscle strength and growth. Slow pushups are an excellent way to use TUT. 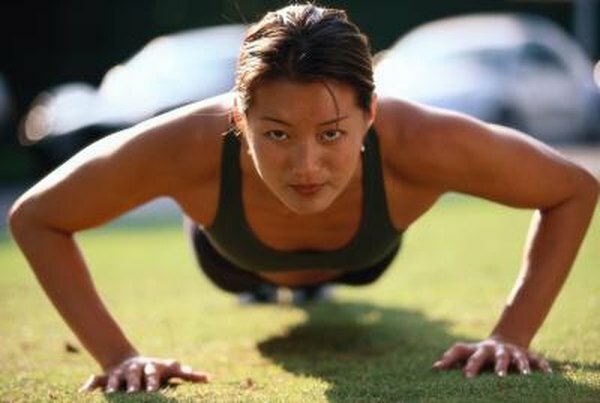 Performing a pushup slowly will add a challenge to and provide results from your workout regimen. To perform a slow pushup, take four seconds to raise your body, pause for one second, and then spend six seconds lowering yourself back down. The most important aspect of any muscle-building exercise is utilizing the proper technique. Using improper techniques won’t benefit your workout and can even lead to injury. Doing slow pushups will force you to observe and master the pushup technique. Each pushup becomes a slow and deliberate process, as opposed to fast pushups that can sacrifice technique to get through the set quickly. Slow pushups can also be an effective way to strengthen out your core, a muscle area that standard pushups won't really stimulate. The plank position in yoga is a core strengthening posture that is essentially the upright position during a pushup. By doing slow pushups with their pause at the top, you are mimicking the plank position, which engages your core while working your arms and chest.